A friend of mine, Susan, turned me on to BookBub a few months ago. I’m so happy she did! I get daily emails showing me the best e-book bargains on Amazon, Barnes & Noble, and others. You can choose from many retailers. I have received so many free books through this service, that I’ll never be without something to read!BookBub features more than two dozen genres. From mysteries to biographies, romance to cookbooks, children’s books to science fiction. You can choose as many or as few as you like. This is a free service. By providing your email address, members receive a personalized daily email alerting them to the best free and deeply discounted titles matching their interests. Go to BookBub to subscribe today! Many of the books are free to $2.99. Awesome prices! When you see a deal you like, you just click through to the ebook retailer of choice, and download the book from there. 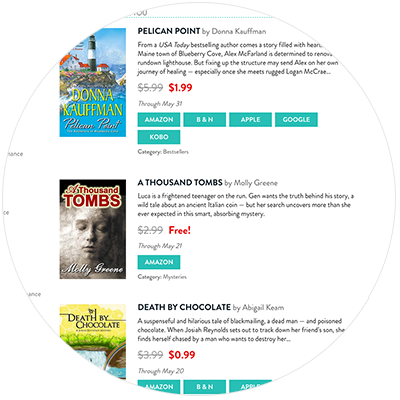 BookBub was founded in early 2012, and has grown to help millions of readers sift through hundreds of thousands of digital books, to find the greatest deals in each genre. BookBub works for authors and publishers too! BookBub is the leading ebook price promotion service. Publishers and authors feature limited-time ebook deals with BookBub in order to drive sales and find new fans across our millions of members. Publishers and authors who have their books selected pay a fee to be included in the BookBub daily email. Pricing is based on the genre and price of the ebook.